The Timothy Taylor's team are dedicated to producing beers of the highest calibre for all to enjoy. We are aware beer can be a forbidden fruit for some when brewers use cereals high in gluten. This makes their beers inaccessible for those with coeliac disease and other protein-based intolerances and allergies. 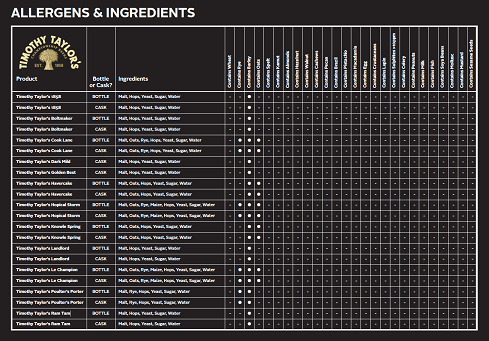 Download the table to view our allergen and allergy information in full. We only use the finest barley with low nitrogen levels and other adjuncts such as rye, oats and maize in our beers. We do regularly test both our bottled beers and cask ales for gluten content via the ELISA test method. Our bottled beers will routinely return results below the 20ppm detection level for gluten and could therefore be classed as gluten-free. Our cask products routinely return results above the 20ppm gluten free mark and are yet to register at more than 100ppm. Between 20ppm and 100ppm beers can be claimed to be very low in gluten content. We do not currently have the ability to make complete assurances about each batch of beer we brew in relation to gluten as this is dependent on the harvest of the cereals we use. Sensitivities to gluten are a complex thing, and also a very personal one. We are often told by those affected that they are able to drink our beers with no ill effect, including one of our own brewers (a coeliac) who drinks all of our beers daily in cask and bottle. However, we are all unique and may respond to the cereal proteins in our beer differently. We truly do passionately craft our products for all to enjoy and hope that you are able to try our range of bottled and cask ales. 20ppm of gluten (the generic term for all proteins known as glutellins and gliadins) is the lowest gluten level that scientifically can be measured, and the level at which products are deemed to be gluten-free. The most common test method is the ELISA (enzyme-linked immunosorbent assay) method designed for detecting and quantifying substances such as peptides, proteins, antibodies and hormones. Other names, such as enzyme immunoassay (EIA), are also used to describe the same technology. This method is used because it is the body’s immune system reacting to the wheat protein that impacts health. Individuals respond differently to varying levels of the different proteins. The most common reaction to gluten is related to wheat proteins but some of the population are affected by Hordein. Barley and other cereals contain the protein Hordein (a glycoprotein), which together with gliadins and glutelins are all classified under the general umbrella term of ‘gluten’. Many cereals contain ‘gluten’ or gluten-like proteins in differing amounts. Some people are sensitive to Hordein due to disorders such as coeliac disease or gluten intolerance.